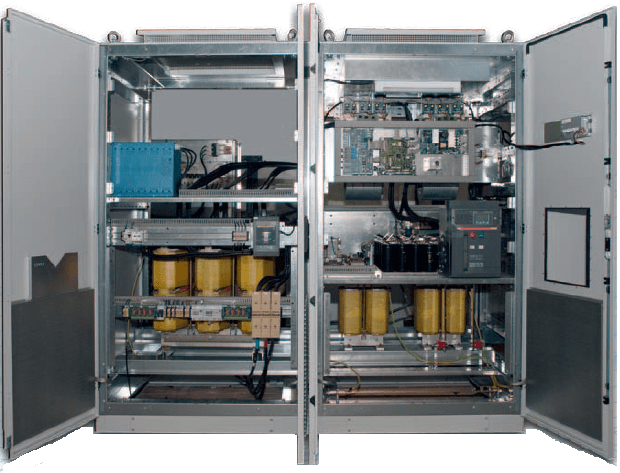 ACSP, the AMPERIS battery charging rectifier, is an energy converter for industrial use designed to ensure a constant power supply in association with the batteries. The series of rectifiers and battery chargers for industrial use is based on total control 6 or 12-pulse thyristor bridges. We can supply a wide range of systems with voltage output from 24 V DC to 220 V DC and current output up to 2000 A. The equipment is installed inside stand-alone, self-supporting cabinets. The frame and the panels are made of steel. The protection degree is IP 20 (up to IP42 upon request) and IP 20 when the panels are open; access to the equipment is from the front. The equipment is designed, manufactured and tested in compliance with the applicable IEC regulations. Redundant fan system with temperature and air flow control. 4 adjustable voltage levels (the rectifier can operate as a power supply at the rated voltage or as a battery charger. Adjustable times and alarm thresholds. Temperature compensation programmable on the charging voltage to prolong the battery life. Digital microprocessor control (DSP + PLD). Full optical isolation on all the logic and interface cards. Low input harmonic distortion with the twelve-phase bridge and the optional input filter. Certified to withstand the harshest environment conditions. Efficiency exceeding 90% (low-frequency transformer included). 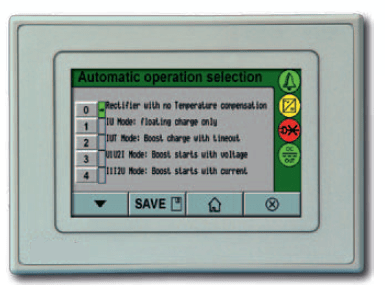 Modbus communication interface through RS232 or RS485 port. “H class” input isolation transformer. The series of rectifiers and battery chargers for industrial use is based on total control 6- or 12-pulse thyristor bridges. We can supply a wide range of systems with voltage output from 24 V DC to 220 V DC and current output up to 2000 A. The equipment is installed inside stand-alone, self-supporting cabinets. We are designed a wide range of parallel solutions to increase the general system MTBF until making it virtually infinite. Thanks to a CAN BUS communication card, in fact, the different rectifiers divide the load into equal shares, and manage a complex function exchange system. The single-branch redundancy allows to keep the load and the battery powered by two parallel digital rectifiers, that by dividing the currents reduce the strain of each rectifier. The load, requiring a voltage level lower than that of the batteries, is powered through a redundant DC/DC converter. In case of failure, the other rectifier will take on the whole load.